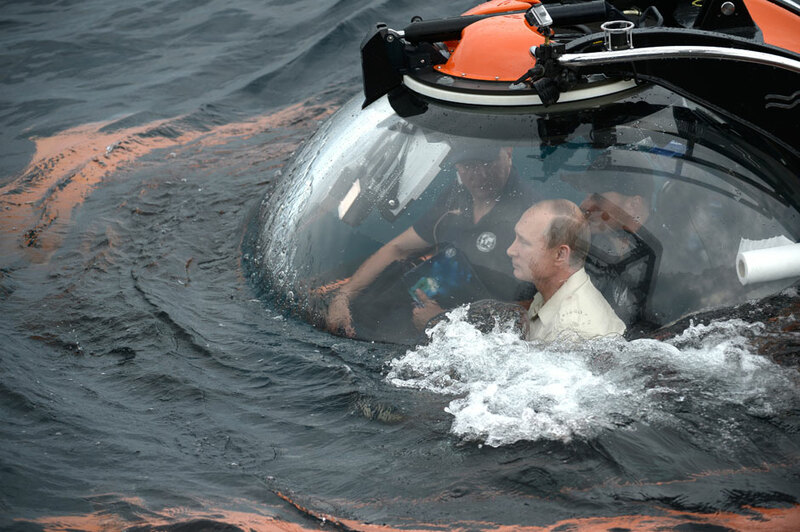 Putin sinks beneath the waves in the bathyscaphe. Russian President Vladimir Putin has described as "interesting" his experience of submerging to more than 80 meters deep aboard a bathyscaphe as part of an expedition of the Russian Geographic Society, saying that he could have reached the same depth in a diving suit but that he would rather leave it to professional divers. "This is still something that specialists should do, submerging to such depths. This is a fairly difficult thing to do. It requires a diver, when he goes up, I forget how long, I think it takes one around 50 minutes to go up. He stops at several points," he told reporters of his submerging experience when asked if he would have the guts to go down that deep in a diving suit. "Perhaps, it can be done but I'd rather leave it to the specialist," he said. Asked about his sensations during this submersion, Putin said: "It was interesting." He also said it was not a frightening experience. "At [Lake] Baikal we went almost 2,000 meters deep aboard our Mir submersibles," he said. The Russian leader said the watercraft, in which he was making the submersion on Aug. 18, is not designed for such a depth, its maximum depth being around 300 meters. Asked where he feels better, on earth or under water, Putin said: "Better at home, of course." Putin dived to the Black Sea floor on board a bathyscaphe and observed a galleon that had sunk in front of Balaklava Bay. "It's a very interesting object, it still has to be explored, and there are not so many objects of this kind in the northern part of the Black Sea," Putin said. "It's roughly the 10th-11th century, just the time when Russian statehood was taking shape and ties with the Byzantine Empire and other countries were developing. Therefore, I think, this should be interesting both to specialists and the common public and should prompt us all to pay more attention to national history, look for something new and use it for today and for the future," Putin told journalists following the dive. The president said it was difficult to observe the ship, as even those parts of it not stuck in the seafloor are covered by a 40-centimeter coat of silt, but presumed that it is 27 to 30 meters long and 13 to 15 meters wide. "But there are a lot of various objects, including parts of the vessel itself and its skin. And yes, there are a lot of amphorae scattered around there," he said.